Softly, soulfully, gently brings you back to the center with her bluesy vocal jazz. ...Faith Gibson loves the songs she sings more than she loves the sound of her own voice. This woman can belt with the best of 'em and has plenty of vocal dexterity, but it’s her subtlety, restraint, and quiet humor, along with a flawless instinct for what's needed where and when, that make standards like Fats Waller's "Honeysuckle Rose" and Dave Guard's "Scotch & Soda" feel fresh and surprising. The latter tune is even more surprising, thanks to J. P. Weber's Delta blues guitar intro and interludes, which segue smoothly into rich jazz chords to accompany the vocal. Faith's takes on two of the jazziest pop/rock tunes ever written, Van Morrison's "Moondance" and Randy Bachman's "Undun" (recorded long before Kurt Elling thought to do it) are, at first, both looser and less urgent than the originals. The intensity builds, not with instrumental insistence or vocal acrobatics, but through Faiths simple, clear telling of, and growing involvement in, the story of each song. She's da bomb. I used to drive home from work, in crazy traffic, at the end of a tension-filled work day, and kick the cat. Now I am all about the purr of the feline... all relaxed when I arrive at the casa. What's my secret? Faith! She's softly, soulfully, gently bringing me back to center all the way home from work each and every day. Thanks for the sanity !!! 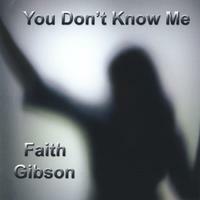 Faith Gibson’s first CD presents an accomplished singer with a sensual touch to her voice. The virtuoso, bluesy guitar of J.P. Weber stands out among the accompaniments in various combinations of piano, bass and guitar. Faith Gibson shows consummate versatility and musicianship on this CD; there are all kinds of different ‘colors’ of her voice on display and she uses all her different ranges. Pianist, Marcus Schinkel, is amazing; he finds some wonderfully unexpected harmonies. The very first time I heard her voice I felt literally hypnotized. The sweetness of her phrasing, the soulful, almost lonely, but yet so positive, color of her voice, captured me. I love Jazz because it comes from the raw, pure, depths of every one’s spirit. You can hear it and you can feel it. It mutates in your skin, and when you breathe it, it turns into the very oxygen you need to survive. When you find a voice that can relate to such powerful beauty, you might as well embrace her and cherish her for many years to come. Faith Gibson delivers a heartfelt interpretation of complicated Jazz favorites like “Honeysuckle rose” or “’Round Midnight” with stunning sensibility, and the title song, the eternal “You don’t know me”, should be already considered a masterpiece in her voice, capable of provoking the flapping of delicate butterfly wings in your stomach. Personally, I would love to see her recording a duet album with pianist Marcus Schinkel next time, but that is a whole different story. I love the equal presence of the musicians in the songs. Some vocalists tend to develop a sense of territorial selfishness that endangers the availability and capability of some projects to reach a higher level of musical perfection. Jazz should be shared and understood as a whole, where every piece is connected and every voice, whether it comes from a vocal chord or from a horn, piano key or string, is important and necessary for the magic to happen. Faith Gibson gave the band as much space as they wanted to populate with their instruments, and the result is simply delicious. This is a marvelous first album.